The Irish name, Aughnanure – Achadh na nIubhar, means field of the yew trees. The yew is dark and mysterious with strange and mysterious associations. It is evergreen and long living; some would claim that it has survived for one thousand five hundred years. Its wood is strong and flexible and was once selected by skillful archers for their bows. 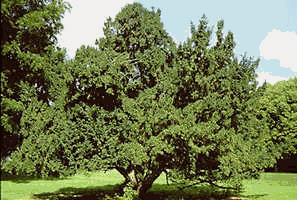 The yew tree was a very popular tree in graveyards, it helped prevent the desecration of graves by livestock and other animals who were harmed by its foliage which is especially poisonous when half withered. In olden times horses ferried the dead to the graveyards often took ill or died on arriving home after nibbling the yew trees. Throughout Europe, early Christian missionaries taught their message in the shade and shelter of yew groves – much as a catechist does under the shade-trees in many parts of Africa. The early churches were built close to these groves and the first Christians were buried around them. Later, yew trees were planted where churches and cemeteries were laid out and soon became signs of continuity in faith and ongoing life. Indeed throughout Christendom they gradually began to symbolize the Resurrection of Christ and life ever lasting. In Ireland yew trees grow more around the coast than in the central lowlands. Many yews were planted around 1800 as a symbol of hope that the spirit of freedom would live forever. Some maintain that the trees were planted after the failure of the 1798 Rising as a symbol of life and hope for succeeding generations. Around 1850, after regaining possession of Aughnanure the O Fflaherties at once planted yew trees around about the castle to perpetuate the link with its ancient name. To day, sadly only one solitary yew tree planted at that time grows at Aughnanure, a testament to the desirable qualities found in its wood during the middle ages. A yew tree was planted in the year 2000 to commemorate the New Millennium. The wood of the yew tree was ideal wood for axles, wheels, floors, pins for pulleys, spears, dagger handles, bowls and drinking tankards. It was noted for its strength and durability. 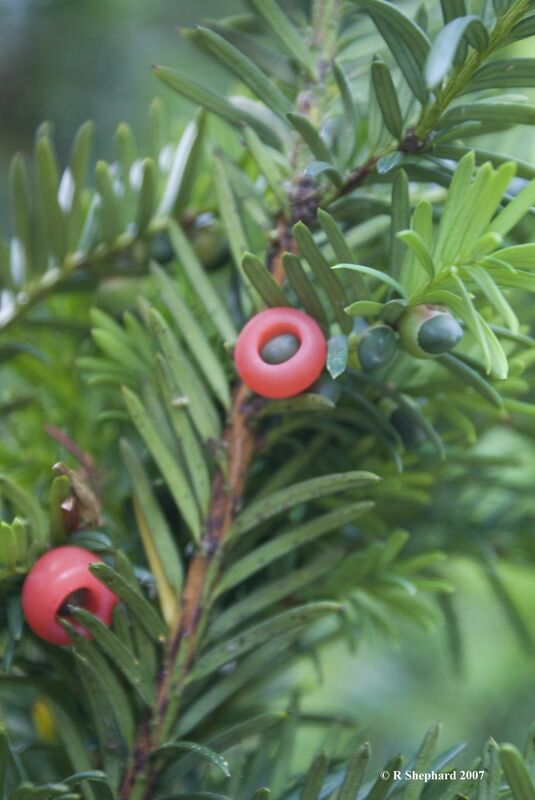 In recent times scientists doing research in cancer are paying particular attention to the medicinal properties of the Irish and Canadian yew trees. Who knows but in the not too distant future we could see the revival in the planting of yew trees? Some trees are bad for farm animals , This happens to be one of them. As lovely as they are buyer beware. This is an excellent article, I have learned something new for today about the Christian Missionaries. Weell done!